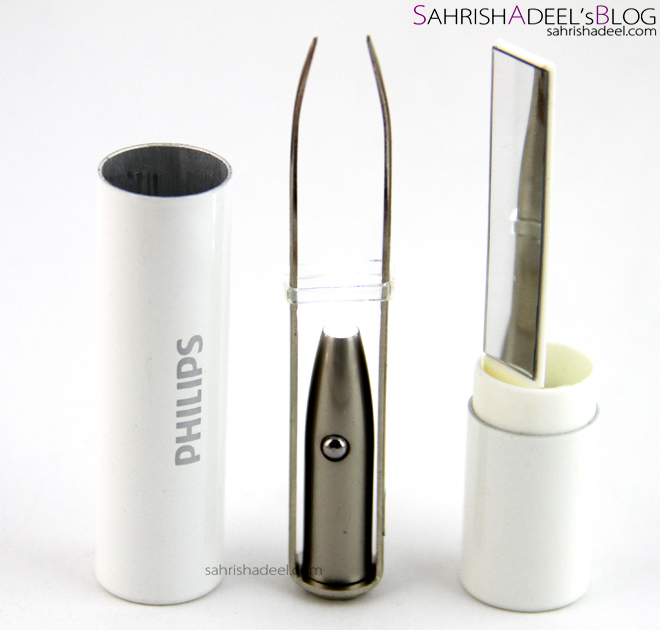 Limited Edition Epilation Set HP6540 by Philips - Review & Guide | Sahrish Adeel - Malaysia based Pakistani Beauty & Lifestyle Blogger! Where hair removal has become an essential part of lives, one should not spend a fortune or bear all the pain to keep up with it. Today I have something for you that can make your life easier and less painful while saving you the money you don't even want to calculate. Satin smooth in minutes, for your total body. Enjoy satin smooth skin with this new total body limited edition epilation set. Stay always party perfect thanks to fast and efficient epilator, precision epilator for sensitive areas and luxury smart tweezers to style your eyebrows. 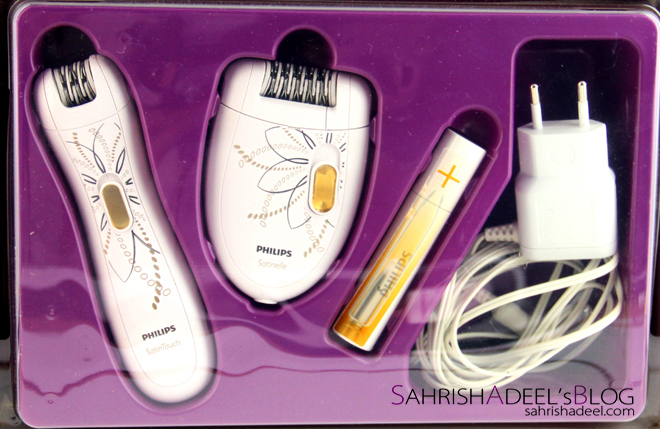 Philips Epilation Set HP6540 is a limited edition set but I have been seeing it in market for over one year now. 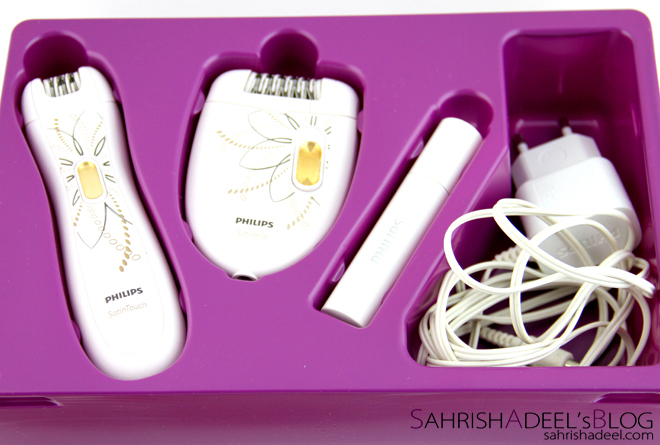 It comes with three items; big epilator, precision epilator and tweezers. 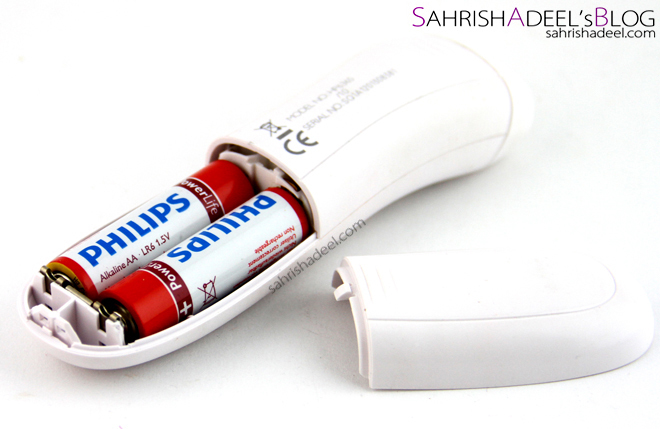 This product also comes with two batteries, one adapter, one dual sided brush for cleaning and one manual. Don't forget to get your warranty signed. I got one year warranty. 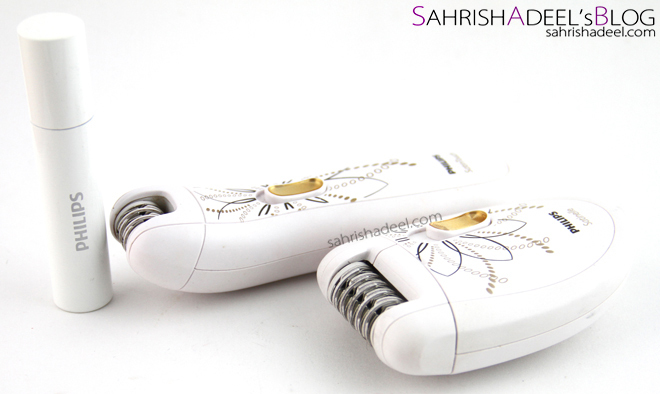 Both epilators plucks the hair from the roots. 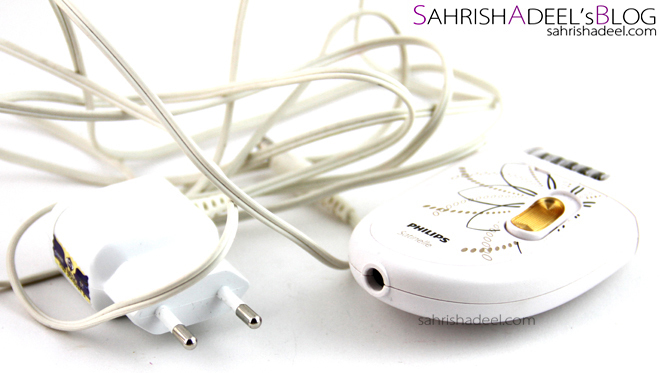 Big epilator has two speeds and it works with an adapter which has a really long wire. It can be used on anywhere on the body except for the sensitive areas; like face and bikini line. Its head is removable so you can wash it. 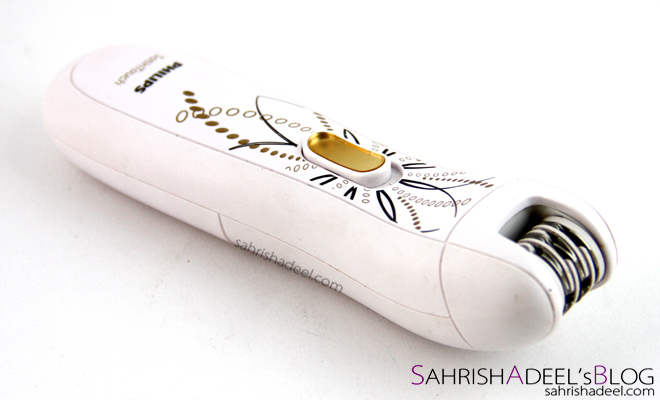 Precision epilator is a cord less and battery operated one. It has smaller head and has only one but fast speed. It can be used for underarms and bikini line but I only use it for forehead and upper lips. Tweezers comes with a battery operated light and a mirror. For me it wasn't really user friendly as it is massive and I like slim tweezers for fast results. But I keep this one in my travel bag all the time as it works fine too. Since I moved to Malaysia, it became really hard for me to find a place for waxing and threading. It is not like I could not find anything at all. I did, but it is heck expensive than what services we have in Pakistan. Then I tried threading at home, which worked a bit for me but I could never thread sides of my forehead as with two hands, I could only hold the thread and not the skin. For the rest of the body, I thought to buy wax but again, it was super expensive. Let me tell you how expensive it was. I got my eye brows plucked, yes with tweezers for PKR 300 (RM 10). For this price in Pakistan, you can get a perfect threading for forehead, upper lips and eye brows. Imagine paying it twice every month. Then for wax, it cost me PKR 2100 (RM 70) (not waxing services but just the wax) one pack which would be enough for one time full legs and full arms. In Pakistan, I could get it done from my salon for PKR 1500. Imagine paying that once every two months. Then I saw this epilator set. It was for RM 200 (PKR 6000) and I was like, ammm lets wait and find some reviews. I literally could not find a genuine review and just adapted my not-so-favorite method of hair removal, i.e., razor. It was a huge time waste for me as I have quite fast hair growth and I would have to use a razor every second or third day. Around two months later, I saw this set for RM 169. I bought it right away without any second thought. Since then, I have been using it and it travels with me. Now let's see what results I got and if this is really worth buying. Oh and later on I bought one more set for my Maa for RM 149, so always look for promotional prices. I have been using this machine since July 2012 and here are the results for each piece. I use it for my arm, legs and underarms. Most of the times I use it on high speed which is less painful but if I don't have too much hair or I am using it for hair on fingers, I use it on low speed. I have used such epilators in past and they were really painful and would break the hair. This one does not break hair at all. I won't say it is painless but this is far less pain than you get when you wax or thread your body. The best thing is, once you start epilating, it numbs your skin. One other thing I notice is that if the hair are short, lets say about three weeks old, you might not feel much but longer hair can be uncomfortable. At the end, it gives a silky and smooth skin and oh, it exfoliates a bit as well. As far as the hair growth is concerned, I usually use it once every two weeks or when I see some visible hair. The best-est thing is, unlike waxing, you can literally pull the shortest possible hair with this machine. Hair comes out soft and in proper direction. It gives reddish and dotted skin after use which on my lasts for about 8-10 hours, mostly if I use it on longer hair. And on one full arm, it takes about 8-10 minutes (longer hair). On short hair, it takes me about five minutes to cover on full arm. On one underarm, it takes about thirty seconds and you cannot believe how slow the hair grows back with a remarkably reduced amount. Since I use this one the most, I really like how its head is removable and washable. Always make sure that the skin is dry, if you are sweating or have some oil, use a baby powder. If your skin is wet or greasy, the metal tweezers in the machine will grip it. Keep it on a 90 degree angle and bend the knees and elbows when you epilate them. Tips: Use it on your body one night before you take a shower. Exfoliate your body in the shower which will cause some under-the-skin-hair to come out and then use this epilator real quick. On underarms, always use if after your shower and don't forget to exfoliate the skin in the shower. This is designed for under arms and bikini like but I have been using it on my upper lips and forehead. It has a faster speed which cause minimum pain on my forehead and 1/10th of threading pain on my upper lips. I can easily hold my skin on sides of my forehead with one hand and use it with the other hand. I get a bit of redness on my lips but that lasts for about 30 minutes or so. It does not give me any cuts or break my hair. Since this is cordless. I love how I can use it anywhere and can carry it easily. It is easily cleanable with the brush and to make it more sanitize, I spray it with methylated spirit (95% alcohol) every now and then. Make sure that your skin is not oily or wet. Use a powder if you need to. I use a face powder with a brush to make sure that my skin is dry. It catches the skin if it is oily or wet and that is not pretty, trust me because I scratched my upper lip once while being lazy. This pair of tweezers is my most disliked item in this package. It has a light which is helpful but since it is in the middle of the grip, it makes it hard to press it. I like my tweezers, slim and soft of press which makes the process really easy and less hectic on my hands. It also has a mirror so I just keep it in my travel kit in case I would need it. As far as the job it concerned, it works well. It does not break hair and is quite travel friendly. Overall, I have been using it for about eight months now and I am loving it. I know I have saved a fortune and so much time by investing in a good product. My mother and sisters have been using one same epilator as well and they loved it too. For them, the best part is that it is so easy on skin. I will highly recommend this epilator to everyone. If you want to send a lady a gift, get this for her. I always use my Intense Plus Hydra Soothing Cream after I epilate on face and body. It helps to reduce the redness quicker and soothes the skin really quickly. Recommended retail price for this epilation set is RM 199 but I have bought it once for RM 169 and then the other time for RM 149. It is available on all Guardian drugstores nationwide in Malaysia. I am sure it is available in so many other countries as well so make sure to inquire about it. If you have any queries, feel free to leave in the comments and I will add all the answers at the end of the post. 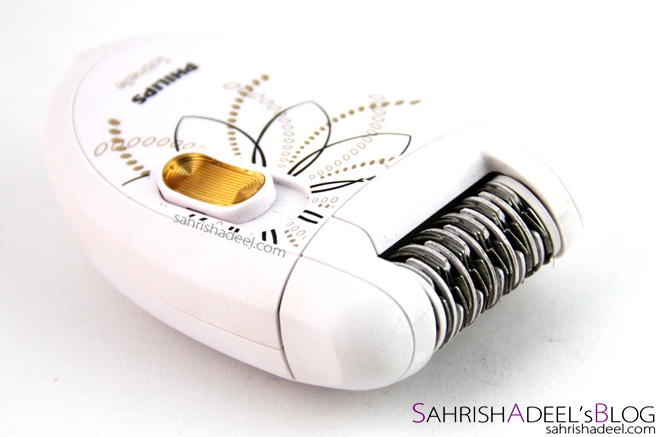 Do you use an epilator? Share your experience with me.